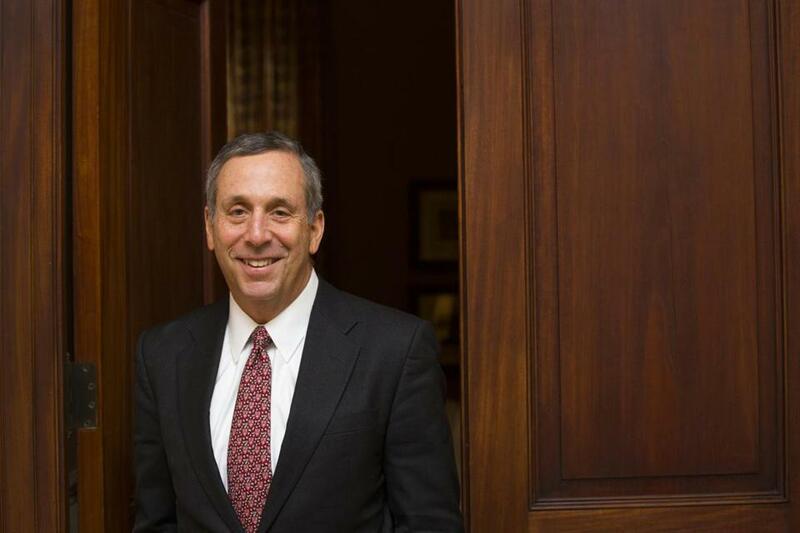 Harvard trustees announced Sunday afternoon that lawyer, economist, and former Tufts University president Lawrence S. Bacow will replace Harvard’s Drew Gilpin Faust, who is retiring in June. When Bacow — who had been named to the presidential search committee but stepped down after agreeing to be considered — starts his new position in July, he’ll be inheriting the university’s top office during a relatively peaceful time. But the next decade in higher education is likely to be rocky as campuses across the country, including Harvard, have been roiled over the past year with controversies over free speech, immigration, diversity, and inclusion. The Michigan native is no stranger to Cambridge: He majored in economics as an undergraduate at MIT before earning his law degree and PhD at Harvard. He worked at MIT for 24 years and was the chancellor of the school before moving on to Tufts. In 2006, as Harvard was hunting for its 28th president, Bacow’s name appeared as a possible replacement for then-president Lawrence Summers. In an e-mail to the Tufts Daily, Bacow told the publication that he took the top job at Tufts “expecting it to be my last.” The search committee later named Faust to the position. “I would not be standing here today, literally, if this country had turned its back on my parents,” Bacow said during a press conference Sunday. Financial aid at Tufts for undergraduate, graduate, and professional students rose nearly 94 percent during Bacow’s tenure, according to the Tufts Journal. It was also under Bacow’s watch that in 2007, the university replaced loans with grants for families who make under $40,000. She was working her first job at a management consulting firm, his roommate was dating her college roommate, and the pair were “fixed up,” according to a profile in Tufts Magazine. Their first date was an Armenian cultural festival in Watertown. They married in 1975 and have two sons, but no pets — Bacow is allergic to both cats and dogs. Bacow, according to Tufts, is an avid runner with at least five marathons to his name (four of which were in Boston). He was also known for taking early morning training runs for the Boston Marathon with Tufts students, faculty, and staff, according to the New York Times. During his tenure as Tufts president, Bacow ended the annual “Naked Quad Run” — a tradition where students would go streaking through the campus — over safety concerns. “Even if I did not act now, NQR would end some day. The only question is whether a student has to die first,” Bacow wrote in a 2011 memo to the community announcing his decision. Bacow will likely face similar decisions at Harvard, where the university’s “Primal Scream” event — where students run naked through Harvard Yard — continues. Meanwhile, Bacow — who was in a fraternity at MIT himself — will have to face the ongoing pushback against the school’s decision to curtail off-campus, male-only social clubs, which administrators say foster a party culture that leads to sexual assault. The fate of the social clubs, which count US presidents and powerbrokers among their alumni, has sparked fierce debate among Harvard’s students, faculty, and graduates over the past two years. Clarification: An earlier version of this story mischaracterized the presidential search committee’s process of picking a leader. Laura Krantz of the Globe staff contributed to this report. Aimee Ortiz can be reached at aimee.ortiz@globe.com. Follow her on twitter @aimee_ortiz.